Vitamin C Skincare – worth the hype? Today I’m going to be talking about the benefits of Vitamin C Skincare and introducing two incredible products which might be unfamiliar to you guys! Super Facialist is a UK based, cruelty-free skincare brand which can be found at various Boots stores for a reasonable price – think the effectiveness of Clarins and Clinique products, with the price-tag of the No.7 collection. There are various ranges to choose from which all target different skin concerns. 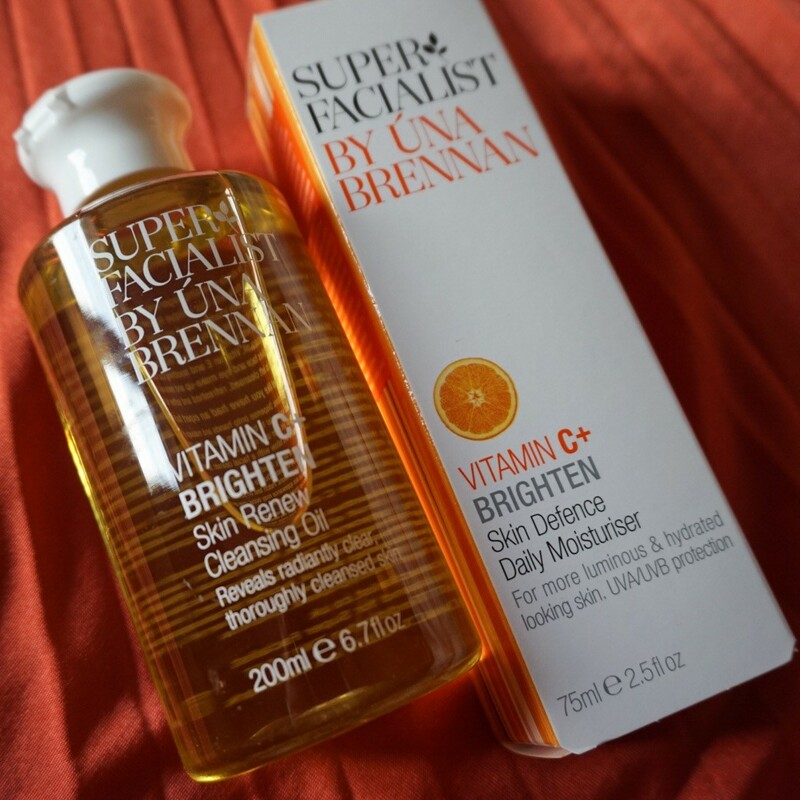 I love the Salicylic Acid range, but today I’m going to be discussing the Super Facialist Vitamin C Cleansing Oil and Skin Defense Daily Moisturiser. Before I go ahead and review both products, I just wanted to breakdown the benefits of Vitamin C skincare and explain why the biggest beauty bloggers have introduced it into their daily regimes. Although NOT an alternative to suncream, vitamin c works hard to protect skin against UVA and UVB rays. Due to the fact that it’s an ‘anti-oxidant’, it strengthens skin to naturally combat damaging factors… like the sun. Did you know – Vitamin C helps your skin to produce collagen faster? As you all know, collagen reduces the appearance of wrinkles and lines, aiding a more youthful complexion. It also perks-up dark under-eye circles by evening out the skin tone and adding ‘vibrance’ to tired skin. Suffer with blemishes and acne scars? It’s recently been proven that vitamin c helps to reduce the amount of time it takes for skin inconsistencies to heal. 4. STAYED IN THE SUN FOR TOO LONG? While I NEVER condone anyone sitting in the sun without a layer of suncream applied – we’ve all ‘been there and done that’. If you are looking a little… pinker than usual, vitamin c can be a great option alongside aftersun. It’s hydrating properties mean that the dehydrated skin will rejuvenate faster, the vitamins work hard to strengthen broken skin-cells and reduce itching. SO, WHY TRY THE SUPER FACIALIST VITAMIN C RANGE? Firstly, I just wanted to say how much I love this Cleansing Oil, I’m seeing it increase in popularity across Instagram rapidly (after it was featured on This Morning). I haven’t previously tried any oils, but now that I’ve introduced a pre-cleanse into my evening skincare regime – I don’t think I could go back! Rather than using a makeup wipe, I now rub a small amount of this product between my fingers and rub into the skin, then add water to form a slightly milky consistency. Finally, I use a clean face cloth to remove any dirt and grime from my face, followed by a foaming cleansing wash, scrub and moisturiser/oil. Where the Super Facialist Vitamin C Moisturiser is concerned, I am IN LOVE. It smells absolutely incredible and the consistency is extremely nourishing. It takes a little while for the product to sink into the skin, but once it does I HONESTLY feel like my skin looks ten times brighter! It also makes makeup application extremely easy, due to it’s intense moisturising capabilities. It’s fair to say that I love both products and am thankful to have finally introduced vitamin c into my skincare regime… it’s definitely worth the hype! like what you read? Let me know if you’d like to hear more skincare advice in the comment space below!